Hydrotechnik Particle Counter | R & S Hydrauliek B.V.
Test points – sensors – measuring instruments – software. Hydrotechnik develops, manufactures, and sells solutions for the complete workflow of professional measuring technology. Our sensors for all usual measurements are reliable, strong, and available for a large number of applications. Hydrotechnik developed the Intelligent Sensor Detection System (ISDS) that is used to hand-over sensor parameters and linear tables when the sensor is connected to the measuring instrument. This means a reliable plug-and-measure. The Hydrotechnik family of professional measuring instruments supports measuring engineers and service technicians during their daily measuring tasks. A suitable instrument is provided for each field use: beginning with a cost-efficient entry solution to complex measuring systems for demanding test routines. Beside professional hardware, Hydrotechnik offers efficient and easy-to-use software solutions. 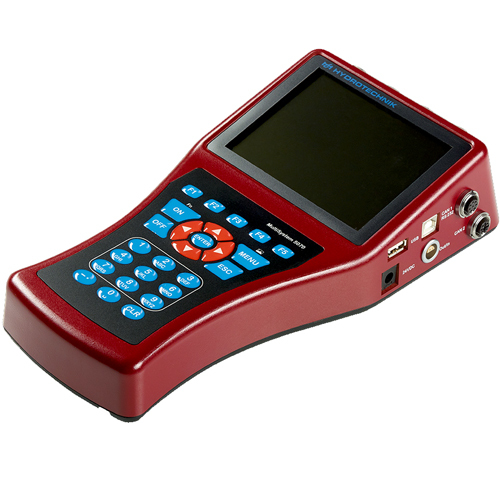 These allow the transmission of measuring data to PCs and their analyzation, evaluation, and presentation. The unique software package HYDROgen + HYDROrun for the generation and execution of automated test procedures allow the use of our mobile measuring instruments during final testings and in testbenches. The name of the product line, Minimess, comes from the Hydrotechnik in-house invention, the Minimess® test point. This coupling builds up an interface to a running hydraulic system. According to the test point, Hydrotechnik offers a huge portfolio of high pressure hoses with diverse kind of fittings, as well as gauges. Analog and digital gauges are available as a set, but also separately. Special versions of the test point for gas applications complete the portfolio of Hydrotechnik. Hydrotechnik is the inventor of the Minimess®-test point – nothing is better than the original. For monitoring, controlling, and diagnostics of your pressurized systems, it is necessary to conduct measurements e. g. pressure, temperature or volume flow. The documentation of the measurement data is the foundation for evaluating the measured data. The instruments Hydrotechnik offers with its product capabilities in combination with professional software offer a huge range of functions – mobile as well as fixed. A few examples are permanent measurements and measurements started through a trigger (the measurement primal starts when a certain value is reached or a certain incident arrives). The diagrammed presentation of your measurement, creation of a measurement log, and the image of testing conditions without programming experience are all possible with instruments from Hydrotechnik. The instruments can collect fixed and mobile sensor data. They offer the user a minimum of 2 and maximum of 40 incoming channels. One of the main characteristics is the convenience of the instruments. From the entry-level model up to the 40 channel instrument all are easily handled by the user. The success of a measure depends on the reliability of the data collection. The HySense® sensors by Hydrotechnik stand for quality and reliability. They are available for diverse measuring ranges, e.g. pressure, temperature, flow and other variables. Patrick is an optical particle monitor working according to the light-extinction principle. It can be used to monitor the impurity level and the purity trend of liquids very accurately. The purity classes can either be displayed according to ISO4406:99 or SAE AS4059E. The data transfer can be managed flexible via CAN or RS 232. If your PC does not have a RS 232 interface, you can transfer the data with an USB-to-RS232-adaptor. Patrick enables diagnosis and controlling of the quality of the oil of hydraulic systems. As a condition monitoring instrument, it completes the product portfolio from Hydrotechnik. Condition Monitoring is the supervision of the status of a machine or plant, to draw conclusions on the demand for maintenance or repair measures from the changing of certain parameters. This allows planning such measures exactly and possibly reducing downtimes significantly. For the application of the instruments with data processing, Hydrotechnik develops its own software in-house. With HYDROcenter, HYDROcom6, HYDROlink, HYDROgen, HYDROrun as well as HYDROboot, Hydrotechnik supports you in achieving your measurement requirements. From the data analysis, over remote control to your instrument, up to programmed test procedures, Hydrotechnik offers you the right product for your application. Besides the mentioned examples, Hydrotechnik software products offer a huge range of functions which save time and money. © Copyright 2019 R & S Hydrauliek B.V.